Have you ever had any thought on what will happen on the day when NCHMCT JEE Admit Card 2017 will be announced? Yes, this is truly a nerve-wracking question to the candidates out there. Since you have come too far, you cannot just give up like that. What we meant to say is that downloading NCHMCT JEE Exam Hall Ticket 2017 will really pay you off and you will not regret getting it later on. This is for only one reason i.e. it is having your JEE Exam Date (the day on which you are supposed to be in exam centre). And, being aware of the latest news on the issuance of the Admit Card and other beneficial updates is highly suggested. Along with Exam Date, a straight link to NCHMCT JEE 2017 Admit Card will be shared with the aspirants. The JEE is going to be conducted on 29th April 2017 at total 33 Exam Centres and all contenders must report at the given test venue before some minute of the beginning of the exam, let’s say 60 minutes. You would have been given options in the application form to choose the preferred exam centre and at that time, you would have your favourite one. Now, there is no candidate who is allowed to do modification in exam centre name, however, if you have valid reasons, you can request for the same before 14th April 2017. Latest Update: The timing for JEE is 2:30 pm to 5:30 pm. In other words, the exam will be of 3-hour duration. To download your NCHMCT JEE Admit Card 2017, you will need to entry any 2 of these: Email, DOB, Application Number. Most of the students who are going to appear for NCHMCT JEE (Join Entrance Exam) 2017 are thinking about their performance. They think about the shortcuts to get the upper hands over others but we want to tell such aspirants that there is no shortcut that will work. All it takes is your passion and hard word. Some people think that the server of the Official Website will be as same as it is today but they have no idea about how busy the servers will be at the time of Admit Card being published on the site. Now, you must be thinking that can some get rid of this server-related issue? Well, there is the solution for everything and so is for this one. If anyone faces any issue regarding the “Server Not Responding” or some kind of other ugly “Errors”, then nothing can be done from the user side. 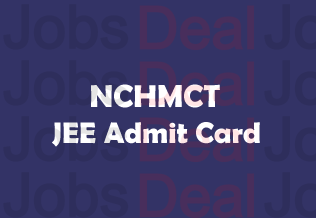 However, there is a trick of getting your NCHMCT JEE Hall Ticket very much faster and this can be done by being up-to-date because no one wants to face trouble due to more traffic on the site. That is why the best timing for the download is said to be just after release. The Admit Card, whether Duplicate or Original is to come out all the way through the link called nchm.nic.in. The full form of JEE is Join Entrance Exam and this is for the session 2017. The Hall Ticket for the Test Taker will be issued uniquely. In other words, the information that it will carry will be unique to everyone else who applied, however, somehow related. Without the provision of important account credentials, it is almost impossible to grab the Call Letter for being eligible for the exam. You have to present yourself in the centre with NCHMCT JEE 2017 Admit Card the timing to report at the venue is 1 Hour before the exam starts. The test will start from 10:00 AM and will be continued to 1:00 PM, viz. the time duration of this exam will be 3 Hours. Try not reach exam hall lately otherwise you have to pay for it and that will really not be a good thing. After you have obtained your Exam Call Letter to take the test, carefully notice down all data which could be the name of the venue and its code. If due to some circumstances, you are willing to submit the request in the change of exam centre, you would be charged Rs.1000/- which will be a non-refundable fee and this could only be done before 14th April. So, do it quicker. In the first step, log on to the authorised web portal, you should click the link below to directly visit it. Once been there, the next thing you have to do is find the link about “Admit Cards” or Exam Date of JEE. Click on that link and fill up asked details carefully so as not to make any mistake. Before finally submitting the details, make sure they are all collect. In the end, save the Hall Tickets and make the presence in the Entrance Test on 29th April 2017 easily. Do you know any other way which you think is better than this one to obtain NCHMCT JEE Admit Card 2017? Please consider telling out team about it to help us improve more and more.